Today I shall review a truly exceptional gardening book: The Family Kitchen Garden by Karen Liebreich, Jutta Wagner and Annette Wendland. This title was produced from the authors' experience in working with hundreds of school aged children while restoring the Walled Gardens at Chiswick House in London as a kitchen garden, and is intended to offer advice for families who would like to produce their own foods but have little horticultural experience. A particularly suitable format when gardening with children. The Family Kitchen Garden is a 224 pages long, in a large soft-cover format and features a wipe-clean cover and high quality full colour pages throughout. This particular choice of format strikes me as highly functional for it's intended audience: by ensuring the thick pages (and especially the cover) can be wiped clean, we need not be concerned about sticky fingers or splashes of mud ruining this beautifully illustrated book when we allow our children to use it. Virtually every page of The Family Kitchen Garden features stunning photography of the plants discussed on the page. On most pages, several photographs are offered, enabling us to easily identify the plant, vegetable, weed or problem being discussed on the page. I was particularly impressed by the descriptions and identifiable images of bindweed which - as a somewhat novice gardener - I had not realized was such an invasive weed and allowed to grow freely near the bottom of our garden for the last few years! Unlike most other gardening books I have read, The Family Kitchen Garden explains what this is, offers identifiable images of the problem, and a full explanation of how this can be dealt with. An excellent approach for the novice gardener, in my opinion, and a welcome change to the texts which assume that - even as beginners - we must know the appearance of all such invasive weeds. The general function of this book is to assist families wishing to start (or better maintain) a kitchen garden - one which can bear foods which both children and adults alike will enjoy growing, harvesting and eating. As such, the methods, plants and skills discussed are particularly relevant for children: from explanations of the easiest seeds that young children may plant, to illustrated instructions for making a ladybird shelter in the autumn months, for young ones to feel they are nurturing the creatures which help their garden to grow. The brightly coloured photographs, playful (yet ornamental) garden creations and brightly coloured side notes all contribute towards attracting the interest of children. I particularly enjoyed reading the scattering of quotes from children who had helped develop the Kitchen Garden at Chiswick house, on which the ideas in this book are based. This section offers an overview of gardening with children in mind, covering all manner of horticultural subjects from planning the crop to propagation; weeds and pest control. Each aspect is covered in detail, using jargon-free explanations and plenty of images which are perfect for those with no experience of gardening. I found the sections about weeds and crop protection to be the most useful, as many of our previous attempts to beautify our humble garden were thwarted by pests, insects and unwanted plants invading our space. However, the sections on soil improvement and fertilization were very detailed and enlightening, ensuring that readers are properly informed about how the soil we choose to use can affect the growth and overall crop of the vegetables we plant. The information for each month's gardening duties is something I found particularly useful. While we can of course find when to sow, plant our and harvest our creations by other means, I believe having a guide for each month in such an easily accessible format ensures we are always more aware of what to be doing at any particular time. Each and every month offers a recipe (or two) for seasonal foods which we may have growing in our own kitchen gardens. Overall, I have found the recipes use ingredients which are the easiest vegetables (or fruits) to be growing, and that all of these recipes are child-friendly, meaning that our children can help us prepare the foods and enjoy eating them too. One of my favourite recipes in this entire book is for "fruit leathers" - essentially, strips of fruit-based sweets which can be produced with ease from whatever fruits we have available for picking at the time. These are just like the "Fruit Winders" you may have seen advertised on TV in recent months, but since this recipe enables us to make them ourselves, we can be sure they are completely organic (though unfortunately not sugar free!). The monthly ideas for creative fun are especially aimed at children. Month by month, this section will enable you and your children to decorate your garden, from willow wigwams to a hideaway for ladybirds; cute plant labels and lavender sachets for the linen cupboards. The final third of the book is quite lengthy as it provides detailed guides for dozens of vegetables, fruits, herbs and flowers ranging from artichokes to zinnias and everything between. This section is very user friendly, with at least one page to describe each individual plant type. With suggestions for propagation, plant care, feeding, watering and potential problems this A-Z allows us to easily look up information on the plants we may be growing, or are considering adding to our kitchen gardens. Each plant's description begins with a brief overview including it's ease of cultivation, whether it can be grown in a pot, if it is particularly suitable as a child's project, and any other useful information of relevance. I must admit that upon first glance at The Family Kitchen Garden, I was unaware of just how much I'd enjoy reading through these pages.Throughout you can find gardening quotes and expressions from the school children taking part in the restoration project of Chiswick House which add deeper meaning to the plants and changing seasons described within the text. The photography is both explanatory and inspirational, encouraging us to tend more to our gardens and to involve our children in the miracles of watching as plants grow from tiny dry seeds to plants we can harvest, cook and eat together. One of the most enjoyable aspects of this book is the scattering of adult humour. This book was certainly written by women who enjoy their craft enough to make light of arduous work in places. For example, when offering advice for dealing with garden pests, we can read of "flying snails": a practise which many regard as "unneighbourly", while the mention of infanticide (with regard to plants, of course!) is guaranteed to make you chuckle. The Family Kitchen Garden is a wonderfully explanatory book aimed at parents (and indeed grandparents) who are curious about gardening with their children. As this book explains, there are many edible plants which can be decorative as well as useful, which helps us nurture a sense of the natural world for our children. I do also believe that this book would be beneficial for experienced horticulturists who have no experience of gardening with children. When I offered this to my neighbour (a self-sufficient gardener who lives from his allotment) he immediately expressed his interest in buying a copy for himself "to share with his grandchildren": it had made him realise that children are interested in watching things grow, and in learning about the environment. Methods of growing organically are mentioned throughout, with the odd reference to non-organic practise for those who truly despise garden pests. As a parent developing a vegetable patch for the first time, I found The Family Kitchen Garden to be an exemplary guide. This is like having three books rolled into one: a guide to the basics of horticulture, a month-by-month planner, and a complete guide to edible plants in a simple, easy to reference format. The ideas for seasonal recipes and creative crafts are wonderful, adding a sense of creativity and inspiration to our gardening chores throughout the year, while the quoted expressions of children's experiences in working in the kitchen garden at Chiswick House helps affirm the sense that this book is a gift for parents to encourage the blessing of garden involvement with their children. 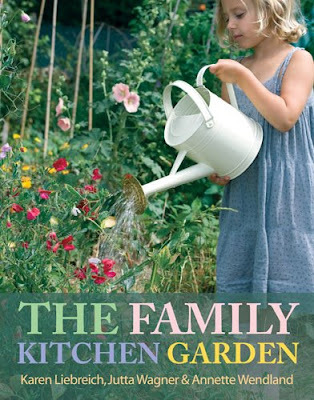 The Family Kitchen Garden is available from Francis Lincoln at £16.99 and can also be purchased from Amazon.co.uk.